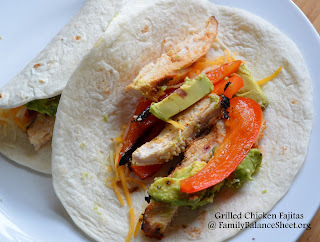 We love Chicken Fajitas and this grilled version is very easy to prepare and was a hit with my family. 1. Pre-heat grill to high. 2. Place the chicken breasts in a plastic bag or between plastic wrap and pound the chicken with a rolling pin, heavy pan, or meat mallet until about evenly ½ inch thick. 3. Combine marinade ingredients. Place chicken in a bowl and drizzle marinade over chicken covering completely. Marinate in the refrigerator for at least 30 minutes. 5. When the grill hits at least 450 degrees, place the chicken and the hobo packet on the middle of the grill. Close the lid. I don’t let the grill go too much over 450 degrees. 6. Cook 6 minutes and flip the chicken and hobo packet. Close lid and cook an additional 4 minutes. An instant-read thermometer inserted into the center of the chicken breast should read 155 degrees F.
7. Remove from grill and let the chicken sit for 5 minutes before cutting into. After 5 minutes, slice chicken into strips. 8. Layer the peppers, onions, chicken strips, and your favorite toppings onto a tortilla. Does your chicken tend to dry out on the grill? Read How to Grill Chicken Breast Without Drying It Out Like the Sahara. Looks awesome! I’d add that you can make your own salsa to go with it. chop 3 big tomatoes, add chilli (red) to your taste, lemon juice, 1 clove of garlic, half a red onion, fresh corrianted, extra virgin olive oil, salt and pepper to taste. Finely dice all ingredients and add them all to a big bowl and let it marinade in the fridge.